I was quite excited when lining up this shot: it felt like it had something a little extra going on. It was taken in a derelict transport office with my Contax 137 MA bolted to a tripod. The film was Tmax 100, the developer D76 1+1 and the lens the famously sharp 50mm f1.4 Planar. It has a nice abstract quality to it but is still recognisable if you look hard enough. I've found the dividing line between a pure abstract, which I'm not so keen on, and those pictures that are abstract enough to be interesting to be a fine one. The thing that caught my eye was the light beneath the left-hand door. Black and white is all about the interplay between light and shade and this scene had it in spades. The light was coming from a south-facing window that had some rambling weeds climbing over it - you can just see the odd shadow line here and there from the vegetation. The aim was to have good, strong shadows with just a hint of detail. I wanted the dark parts to be more or less abstract shapes. They would provide the "structure" on which to hang the mid tones and highlights. I wondered if the composition might appear a little unbalanced with large, distinct shadow areas in just three corners of the frame but I convinced myself that the "open door" idea would benefit from an "open corner". Whatever was flowing into the space from the other side of the door had a path to carry on out the bottom right-hand corner. In truth, I probably under-exposed the neg by about a stop - I didn't allow enough for reciprocity failure. There's detail in the shadows but it requires careful printing to bring it out. This is a work print so don't judge me too harshly. It's a decent effort I think but this neg (turn away now Phil Rogers) might well benefit from split-grading. As it was, I was on the Valoy II again which is difficult to use for split grading as it presently stands for reasons I mentioned a couple of posts ago. 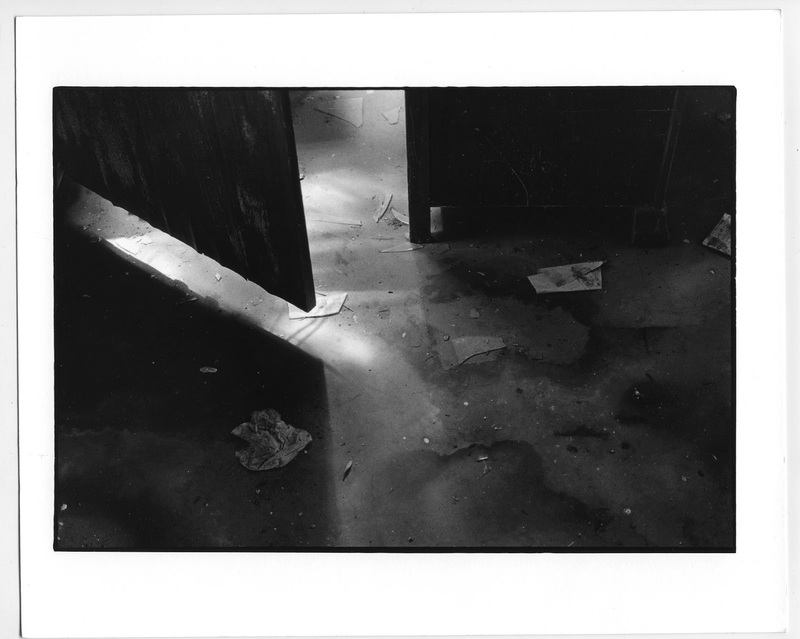 So this print got 7 seconds at grade 2.5 with the shadows dodged for a couple of seconds each. The bottom right-hand corner got an extra 3 seconds to darken it down a little and the bottom edge was burned for another 2 seconds. 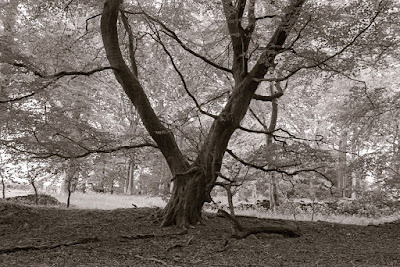 With split-grading, the shadows would benefit from a grade 5 exposure which would help separation whilst the highlights would hopefully retain their delicacy through a grade 0 filter. The bottom right half of the print would also benefit from a boost in contrast. So I reckon this print is only half done. It'll get the split-grade treatment next time. Sorry, Phil. Love the shot Bruce . Full of atmosphere. Nicely processed. The light makes me think of an Alfred Hitchcock movie . I was expecting to see someones foot to step into the door way. Actually quite like it too Bruce -got a nice balance to it and everything looks very natural! Though of course, 5 secs at Grade 2, 1.5 secs at Grade 4.5, 5 secs at Grade 0 and a bit of burning with Grade 3 might perk it up a bit . . . just don't split your trousers you maniac . . .
Can't help it. Must be my split personality. Why not print at 2 and dodge the bottom left? Seems easier that all that mucking about with filters. And why not use the excellent Durst? No doubt there are good reasons. On the other hand, I do like the shot very much. It's a "glance" rather than a "gaze", one of those things that your eye sees and enjoys, rather than a visual report on an object. Most photographs seem to be of objects rather than visual delight. "Windowsill Dreaming" is a visual delight, as is "Martinique" whereas "Clearing Winter Storm" (and "Mum at Blackpool" of course) is a record. Your picture is at the MonorWhite/Kertesz end of the spectrum. A small note on printing grades: I've found it very difficult, visually, to go to a softer print in one printing session. The eye had accustomed itself to the higher impact of the contrasty print and the softer one seems flat, even though it may be much better. It's always easier to spot when someone else has been seduced by high contrast and the idea of The Punchy Print. No doubt punching has its place, but not in the tranquillity of the darkroom. The idea, as you'll know, with split grading is to expose the shadows through the hard filter for better tonal separation in thin areas of the negative (assuming, as here, that the neg is a little underexposed). My "feeling" (I never put it to the test) is that dropping a grade or half a grade and dodging the shadows would have resulted in no true black in the deep shadows. The concern was that it would just appear murky. Certainly, that was the impression I got from the grade 2.5 test strip.. My "feeling" (!) is that split grading will bring out whatever texture is in the deep shadows without the need to lighten them too much. I want detail in the shadows but I still want them quite sombre - but not murky. When I revisit this one I'll try both ways and see if there's a noticeable diference. I know that split grading might seem a palaver to some people but I've found it to be quite straightforward, especially on the Philips enlarger. The Durst, as you rightly suspect, isn't available right now. I was going to use it but it's blown a bulb probably due to all the moving and bumping it's had over the last few years. It's a sturdy beast but not as nice to use as the Philips when it comes to multigrade paper. Still, I see some handheld 5x4 in my future so I'll order a bulb today. Good point about the changing of paper grades. Maybe breaking up the darkroom session with a good, hearty lunch is the answer? As for punchy prints? Yes, I'll need to be wary of that, no doubt. It might take a little time adjusting to real prints as opposed to "processed" neg scans which can basically be whatever you want them to be. I definitely don't want soot and whitewash but I'm not too interested in zone system levels of shadow detail (despite what I've already said about the open door print!). I want to get away from overly literal interpretations of things and places. I agree about overly literal. The real answer (but entirely futile) is to have given another half-stop in the first place. I'm not entirely convinced that every print should have a solid, maximum, black-velvet-in-a-coal-mine black. Due to a happy combination of circumstances, I have an Edward Weston Pepper No 30, a real print, made by Cole Weston not Edward, but using Edward's negative, his written instructions and the original light bulb. The blacks are most certainly not solid BVIACM and yet, somehow I like it as it is. But on the other hand, we have established, in a previous post, that my screen differs from yours, so any judgement I may make on this screen must defer to yours, on your screen.